The following is a spoiler free review of Mad Max: Fury Road. Thirty years ago the last Mad Max film was released. All three films are beloved by fans, but it is still somewhat of a cult franchise. Very few people realize just how much the original Mad Max films gave to its genre. 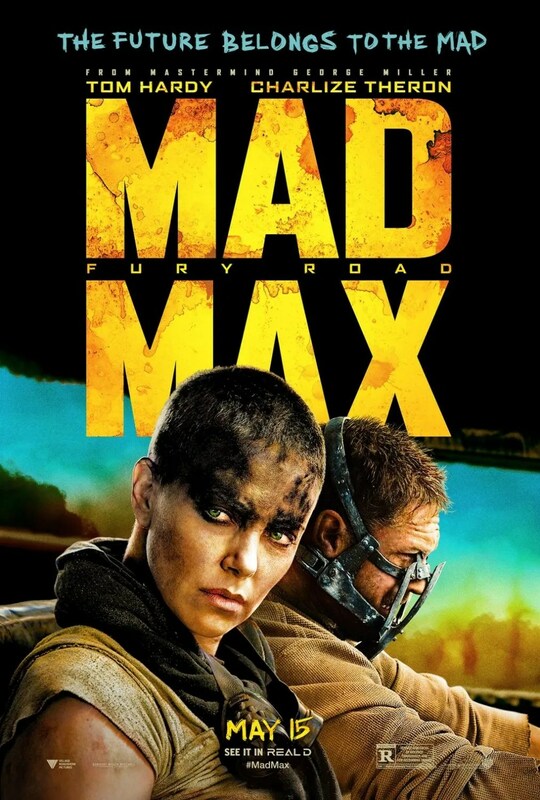 You don’t get many better dystopian action films than Mad Max: Road Warrior – yet Fury Road actually tops it. I’ve said it before, and I’ll say it again: I’m not necessarily a Mad Max fan. Going in to see the Tom Hardy-led fourth installment in the franchise I only loved Road Warrior – the second installment – but as the movie ended I realized something. This sequel makes the entire franchise, each and every installment, much better simply by being associated with Fury Road. It’s that good. This film is intense, From the very first minute to the very last you are treated to some of the best and most intense action scenes that, frankly, I’ve ever seen. Many fellow critics have said this is an action classic in the making, and I agree; it may actually be the best pure-action film I’ve ever seen. Great job, George Miller. You guys do realize that this guy is a seventy year-old director doing the amazingly intense action scenes, right? As for the story, I don’t have any criticism – it makes as much sense as you’d expect. Also, I love how this film can really stand on its own. You don’t have to have seen the previous three Mad Max films, these stories are basically urban legends about this ‘mad’ individual. Immortan Joe is the antagonist of the film – a cult king chasing Max and co.. Now, Mad Max films aren’t necessarily known for their villains, but I enjoyed what Hugh Keays-Byrne did with Joe. As a fun sidenote/easter egg, I might add that Keays-Byrne also played one of the original Mad Max-villains: Toecutter from the original film. Nicholas Hoult’s character, Nux, was a nice surprise in the film. You don’t really get an idea of his importance from the trailers, but his portrayal of Nux is fun, exciting, and a joy to watch. Look, people are going to compare Mel Gibson’s Max to Tom Hardy’s Max from now and until the end of time. Here are my thoughts: Gibson is a great actor, and his Max Rockatansky was very good. But Tom Hardy’s performance is as strong as it could be, and I doubt any fan of the originals would be disappointed with Hardy. Here’s the thing though. Imperator Furiosa is the star of the film. Charlize Theron is magnificent as Furiosa, and to be honest, she is my favorite part of the film. She’s a strong female action hero, and she might be one of the greatest female action heroes of all-time. Definitely her best performance since Monster. Final Score: 9.0 out of 10.0 – Oh, what a film. What a lovely film. I am EXCITED to watch this! You should be 🙂 Extremely entertaining.